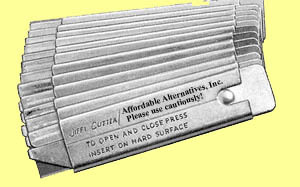 This Jiffy Cutter is the most popular case cutter in the industry. It can be carried in your pocket. Re-insert the shaft so that the bump on the shaft fits onto the recess of the sheath to switch from SAFE mode to CUT mode. It uses the heavy duty single edge razor blades #40474. Do not attempt to board an airplane with this device on your person or in 'carry-on' luggage. Keep this device away from children. cost per cutter (12 or more in multiples of 12.